As September rolls out and October rings in, it’s now time for you to start checking what’s hot and happening in Melbourne to fill in your calendar next month. Melbourne, being the cultural and style hotspot of Australia, has a steady stream of fun-filled and enriching events that can surely delight and surprise you in many ways, whether you’re a local, a new kid in town, or a tourist looking for a weekend adventure. When you’re going about the city, keep in mind that Melbourne’s a busy hub teeming with the usual traffic and other road hassles that you’d rather not face, especially if you don’t want to waste precious vacation or relaxing time. Luckily, booking a car rental in Melbourne is quite easy and can get you around the city to these events hassle-free. Celebrating the best and finest of Australia’s art and culture, the Melbourne Fringe Festival is held annually to recognize and appreciate the country’s local brew of talented artists. Over 3,400 independent artists are featured in the event, providing an avenue of opportunities for them to showcase their works and expand their network locally and internationally. 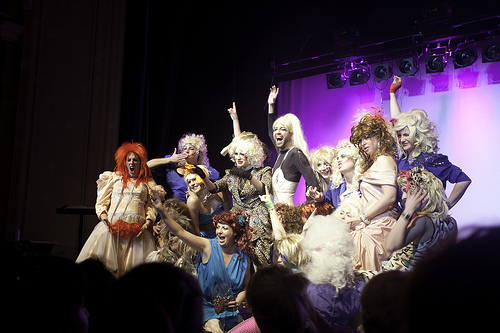 The Melbourne Fringe Festival is celebrated in various points around Melbourne, with venues dedicated solely for the event totalling to over 150 within the city. Aside from art shows and exhibitions, the Melbourne Fringe Festival also provides a great deal of diverse entertainment to visitors, including musical performances, film premiers, visual arts, and cabaret shows, just to name a few. You can check the show list here to better plan your visit and also check which venues you should go to ahead of time. The Festival started in middle of September and runs until the 2nd of October, so you still have a few days left to catch your favourite local artists, watch a few shows, and even get to experience new forms of art before the event closes next week. If this is your first time attending the Melbourne Fringe Festival, you can visit their FAQs page to familiarized yourself with the event and also ease some of your concerns prior to booking a show. For those looking to purchase tickets, you can also buy online to save time. Since the Festival runs in various locations, you can look for car hire services in Melbourne to help you and your friends get to the different show venues around the city. One of the highlights in Australia’s events calendar every year is the much-celebrated and highly anticipated 17-day Melbourne Festival, formerly known as the Melbourne International Arts Festival. Every year, in October, the festival rounds up the best music, dance, theatre, visual arts, and outdoor events showcasing world-famous and upcoming artists in the local and international scene. It’s considered as one of the flagship international arts festivals in Australia and a major multi-arts festival in the world. Like the Melbourne Fringe Festival, this family-friendly event is also held in various venues across the city, including The Coopers Malthouse, Arts Centre Melbourne, The Substation, Melbourne Recital Centre, Arts House, and Dancehouse. Ticketing information for each venue can be found here. First-time attendees can visit the Festival’s FAQ page, which basically answers just about every question visitors can have about the event. Secure parking is also available for those with vehicles, but given the large crowd of attendees, finding a slot may be difficult for you. If you don’t like the headache of finding a parking or if you wish to venue-hop to score as many events as possible, then it’s best for you to rent a car in Melbourne to save yourself the trouble. Get your cash and credit cards ready as Australia’s most anticipated and largest shopping event hits Melbourne this October. The Melbourne Shopping Festival 2016 brings together some of the world’s top brands in the market under one roof and offers huge, huge savings on shoes, clothing, jewellery, furniture — you name it. Items from well-known brands like H&M, Adidas, Mossimo, Alexander Wang, Nike, and so much more are up for grabs at discounted prices. From designer wear to modern homeware, you’ll surely be able to shop to your heart’s delight and even get to enjoy some activities and performances for the whole family. The 3-day Melbourne Shopping Festival takes place at the Melbourne Convention and Exhibition Centre. You can get your tickets here. From arts to music and shopping, Melbourne definitely has a lot in store for you this October. Now time to ring your friends and fly to Melbourne so you can round up all the venues and check out as many events as you can this merry festival season.